Rincon Lodge is located just east of historic Durango, Colorado (approx 15-20 min) where you can enjoy countless seasonal activities such as golfing, horseback riding, river rafting, shopping, dining, and world-class hunting & fishing. Also nearby are Mesa Verde National Park, the Durango-Silverton narrow gauge railroad, two ski areas (Durango Mountain Resort and Wolf Creek Ski Area), and natural healing hot spring spas. 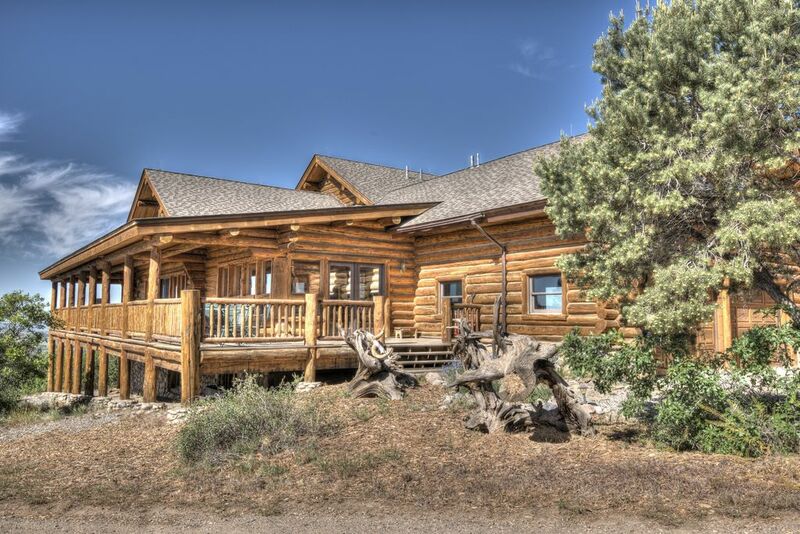 Built in 1995-1996, the lodge itself is a magnificent 6,500 square foot custom log home with expansive wrap-around decks offering views of the majestic La Plata Mountains, the Florida Mesa, and abundant wildlife. Open floor plans, cathedral ceilings, and soaring windows provide views of deer, elk, and wild turkey seen almost daily year-round. Inside the lodge, seven bedrooms will accommodate up to 20 guests with room for more upon request. The main floor has three full-size sofas as well as additional seating for comfortable relaxation and is situated around a floor to ceiling wood burning river rock fireplace with satellite television and a DVD/VCR. Several entryways provide access to covered decks with panoramic views. Private bedrooms include shared full baths and another half bath with shower just around the corner. The dining area and kitchen on the main floor feature a teak dining table easily seating ten people with additional leafs for expansion. A massive elk antler chandelier adorns the area. The custom kitchen and center island features solid granite countertops, a six burner gas range, double ovens, and everything else even the most discerning gourmet cook will appreciate. The center island provides casual seating. The mudroom offers a full-size washer and dryer, a full upright freezer, and a large open pantry. The lower living area also has a full-size sofa and chair seating around a second river rock fireplace and a big screen satellite television with DVD/VCR. It hosts four private bedrooms including a kids "Camp Room" and one shared full bath. Two entryways provide access to covered patios. Take the log staircase to the upper level and you will find the master suite complete with a rustic aspen log frame king-size bed and two private decks with views that will take your breath away. The master bath has a Jacuzzi tub, separate shower, double vanity, and a spacious walk-in closet that includes an extra sleeping area with futon, a ping pong table, or a secluded place to just be alone with your thoughts and relax. Accommodations total two king-size beds, two queen-size beds, one full-size bed, 2 twin beds, 2 sets of bunk bed, and futon sleepers. Radiant in-floor heating is accented by oak hardwoods, carpet, slate, and saltillo tile. There are ceiling fans and portable fans in every room. This house was designed without central air, because of it's alititude! In conjunction with the Lodge for larger parties, the Guesthouse will sleep 4 comfortably. Situated as a studio apartment or 'mother-in-law' quarters above the 3 car garage, it offers the same stupendous views and peaceful settings as the Lodge, located approximately 60 yards directly north. The Guesthouse rents separately from the Lodge at $900 week or $130 per night plus tax/cleaning. It has a king and queen bed, sofa, tv, full kitchen, shower, washer/dryer. IF you do not need to rent the guesthouse based on a smaller group, we will not rent it to another family during your stay! It will just remain closed. No one will be on the property but your party during your stay. Located at 7487', the fully fenced 76 acres of ponderosa and juniper pine covered ground around the Lodge offer endless nature trail hiking, snowshoeing, snow sledding, mountain biking, picnicking, barbecuing, horseshoes, and a ski run in the winter months to keep busy during your stay. Complimentary wireless internet throughout the property. RINCON LODGE has something for everyone! With its spaciousness, unmatched beauty and peaceful surroundings, it is an ideal vacation spot for family and school reunions, or executive corporate retreats and even small weddings. For more information, please contact us at 303-362-0964 or e-mail! My husband, Marty, built this lovely log home in 1996. We had a son in 2000 and thought it would be nice to raise our son near Marty's parents, so we relocated to the suburbs of Denver. That is when we turned the Lodge into a Vacation Rental. Over the years, we have had wonderful repeat guests and made memories with our family and friends at the Lodge. Our caretakers are located near the property should you ever need anything while renting. We also have someone to plow the driveway should the snow becomes over 6 inches. You will NEED 4 wheel drive vehicles or chained tires for winter months (Nov-April) to get up to the Lodge! The driveway is a gentle switchback to the top. Great for sledding! Everyone loves this property! Why? The Lodge itself, the views, the land around the property to hike or sled, the amenities and space within the lodge, the seclusion and tranquility, the authenticity of living in a log cabin in the mountains! A true Log Cabin nestled atop a ridge, that is totally secluded to the outside world. At it's elevation of approximately 7500 ft above sea level, the wind blows through the night allowing for a roaring fire sometimes in the middle of summer. The views can only truly be explained by being there. This fenced 76 acre property will allow your entire party to roam safely without getting lost in the mountains of Durango. All the comforts of home in a large 3 story cabin with radiant heated floors, lots of space and where the only sounds you hear at night are deer walking through leaves or a wolf howling at the moon. Bed sheets, pillows and pillow cases, bath and kitchen towels are provided. 12' x 3' solid aluminum ramp to sunroom entry. Outdoors only in ashtrays. Please don't toss. RINCON LODGE has something for everyone! With its spaciousness, unmatched beauty and peaceful surroundings, it is an ideal vacation spot for weddings, family and school reunions, or executive corporate retreats. For more information, please contact us at 303-362-0964 or e-mail. Please note the Guesthouse is a separate rental. If you chose to add it, it rents additionally from The Lodge. It sleeps 4. Wildlife abounds. Views. Privacy. Peace. Four couples with 8 kids invaded Ricon Ridge and had a great time. Very spacious, lots of stuff for kids. The master is amazing with beautiful views with a connected huge playroom for kids. The owner was most gracious throughout the process and solved a broken microwave on the spot. There was lots of staples available and even a six pack. We left some as well, so if you come after us enjoy some ice cream and frozen chicken on us. Wonderful home with a well stocked kitchen! My family and I just returned from a wonderful trip here. The home was absolutely perfect for all of us including my siblings and their families. The kitchen was wonderful to cook in, had all the utensils and cookware necessary as well as had spices and miscellaneous items. The bedrooms and beds were great! The land and home are absolutely stunning!! Firewood was available and we used it everyday. The heated floor was so nice to have! The home is not far from town and a beautiful drive. Kimberly was extremely responsive before and during our stay. We enjoyed our time here and will definitely be back. Extraordinary beautiful home nestled on top of mountain with incredible views from many rooms in the home. Had the pleasure of staying here with a group of 20 golfers and it was fantastic! Kim K. is a wonderful host and I would highly recommend this property! Incredible views and accommodations - The best of Durango! Great house for a family get away. there was no screen door upstairs and it was rather warm for family sleeping up there. Also one of the fans downstairs didn’t work. Overall great accommodation and our family loved the house. Thanks, Kathy for your 5-star review! I will have the caretaker check on the fan and screen. Your comfort is our top priority! Many thanks to you for choosing our property and please consider booking with us again. We would love to have you back! We celebrated my parent’s 50th anniversary and had 21 of our family members stay at the Rincon Lodge. The house had plenty of room to accommodate us all. The lodge had everything from toiletries, toys for the children, books to read, a tire swing, ping pong table for teenagers, outside patio, and so much more. When I asked my daughter what her favorite part of the trip was, she said the house, despite doing adventurous activities like river rafting and hiking. Kimberly was so easy to work with and always responded my questions in a timely manner. She kept us informed on the conditions due to the Colorado fire and was willing to work with us. We will forever cherish the beautiful memories during our stay here. This property was perfect for my family reunion. Pets are allowed with $500 Refundable pet deposit, per pet. Pet cleaning fees are $50. per pet. CANCELLATION POLICY: The time factor is critical in vacation rentals and your reservation will hold this property off the market. If you cancel for any reason after we have mailed your executed contract, your rent cannot be refunded unless the Lodge or guesthouse is re-rented (less a $100.00 administrative fee). Smoking is allowed OUTSIDE the lodge. No inside smoking. Four Wheel Drive Vehicles or chained tires required in winter season! You are in the mountains and may encounter snakes, mice, chipmunks, rabbits, turkey, deer, elk, mountains and bears. If you are uncomfortable with anything mentioned, this may not be the perfect place for you.